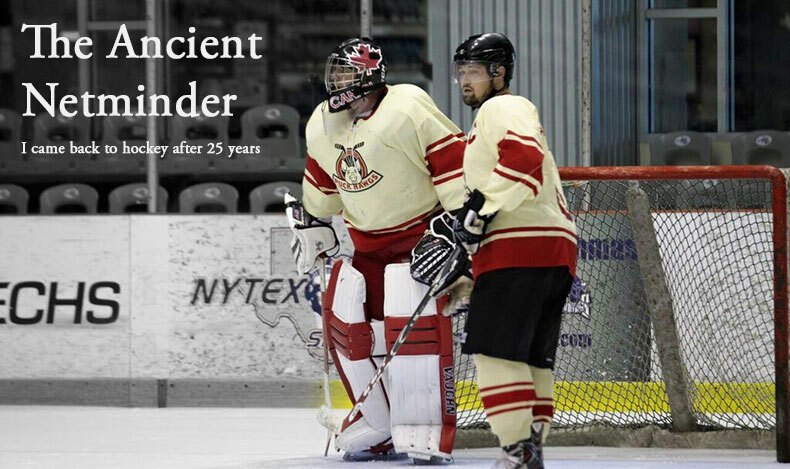 Since the phone hasn't been ringing off the hook with offers from D or C teams who are looking for an ancient netminder, I'm signed up for the next season of I-League (Instructional). During the past few weeks, the league has been running a skills camp for both skaters and goalies. The drills were excellent by getting me repetitions as well as working to understand angles better. Last Tuesday, I saw my buddy and fellow I-Leaguer, Paul come down on a break away drill and I decided to be cute and crash into him. Unfortunately, I ended up sprawled out and took a puck to my kneecap. Somehow, the puck not only found the inside of my pad, but the hardshell kneepads I was wearing also slipped down just enough to expose the spot. I've been in agony since and learned a lesson- don't horse around on the ice! I've also been spending money like a drunken sailor on new equipment. While only returning to hockey four months ago, I've all but replaced every piece I bought in January- some pieces more than once! Some of the gear purchases were out of necessity and safety while others were more financially painful lessons- learning about sizing, fit and comfort. This past weekend I dropped several hundreds of dollars on my third set of pads in four months. Aside from the obvious age differences (the Warriors are the first new pads I've ever owned), you'll note the size differences. 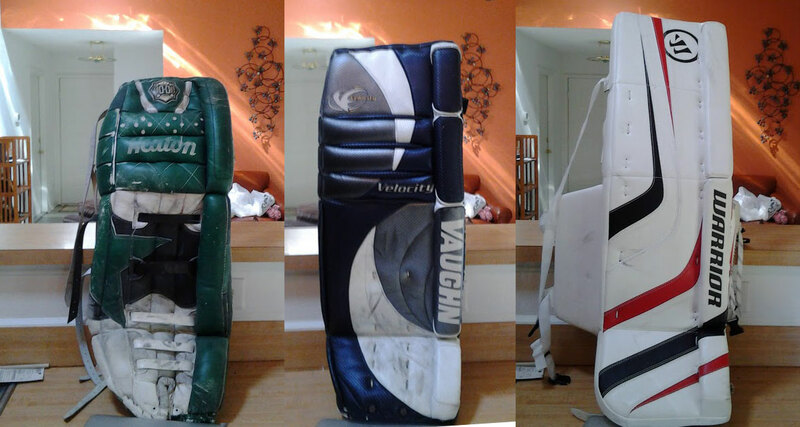 The Heaton and Vaughn pads were both 12" wide while the new Warriors are the NHL regulation 11". The most striking difference is in the height. In my breakneck progression from stand-up to butterfly goaltending, I have learned the value of taller pads with modern design. Smaller five-hole, better skate angle of attack and easier push and slide are all benefits of these new pads. So now the only problem is that I'm running out excuses. Draft night is Tuesday and a new season is on the horizon.